The 30-year-old from Preston, secured the women’s world championship in Malaysia, therefore becoming first British woman in 15 years to achieve that feat. The world number 2 saw off Egypt’s Nour El Sherbini 11-7, 6-11, 11-9, 5-11, 11-9 in Penang to be crowned champion. And makes history by becoming the first English female to hold the British Open and world champion titles simultaneously. History continued being made, as this become the first time ever, the Brits have a Male and Female world champion in squash. 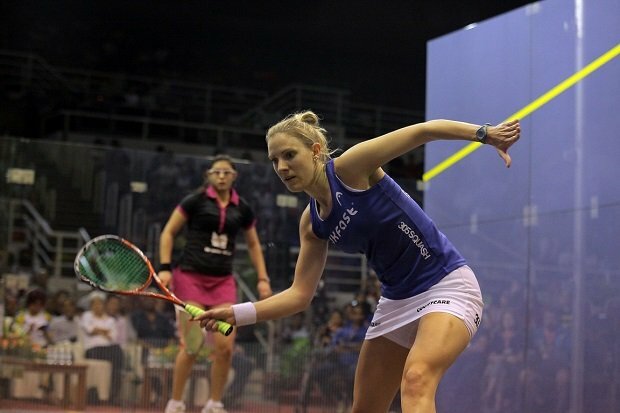 Laura Massaro’s counterpart, Nick Matthew won the title back in November. Laura commented on her win: “To be honest I was really nervous,” Massaro said. “I’ve never really felt this nervous, even though I made the final of the 2012 worlds. It was probably because I didn’t want the opportunity to slip away. “I think knowing that I had to play Sherbini instead of Nicol [David] in the final threw me off my game and it made me a lot more nervous because it was a really good opportunity for me. The new world champion also paid tribute to her 18-year-old opponent, who had pushed her all the way in the final. “She is the future of the game. I’m glad I managed to get a win while I still could,” Massaro said. She shared her big win and her big trophy with the world of Twitter. Massaro, the first Englishwoman to win a world championship since Cassie Campion in 1999, scooped £12,300 in prize money. More recently she has been receiving her well deserved hero’s welcome back home. Where she has been showing her HUGE trophy off with the like of Robbie Savage and BBC Breakfast.